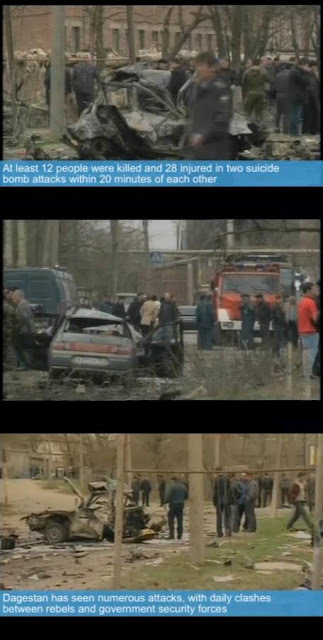 ANOTHER ISLMIC DOUBLE HOMICIDE TERRORIST BOMBING IN RUSSIA……. – The Tundra Tabloids……. MAKHACHKALA, Russia – Two suicide bombers — including one impersonating a police officer — killed 12 people Wednesday in southern Russia. Prime Minister Vladimir Putin said the blasts may have been organized by the same militants who attacked the Moscow subway. The powerful former president had previously vowed to “drag out of the sewer” the terrorists behind the attacks in Moscow, which killed 39 people and injured scores of commuters during Monday’s rush hour. Wednesday’s blasts struck in the province of Dagestan. Bombings and other attacks occur almost daily in Dagestan, Chechnya and Ingushetia, provinces in Russia’s North Caucasus region where government forces are struggling against a separatist Islamist insurgency. “I don’t rule out that this is one and the same gang,” Putin said at a televised Cabinet meeting. The Moscow subway bombings were the first suicide attacks in the Russian capital in six years and shocked a country that had grown accustomed to having such violence confined to its restive southern corner. Those attacks followed a warning from an Islamic militant leader that the militants would bring their struggle to the heart of Russia. Previous Post Previous Post DAVID G. LITTMAN AT THE UNHRC CONFRONTING THE OIC’S FRANKENSTEIN OF ISLAMOPHOBIA……. Next Post Next Post BELGIUM TO BAN THE BURKA……. I can already hear the appeasers – it's all Russia's fault. They are too hard on the terrorists, kill too many, poor and oppressed Muslims, etc. etc. Putin and Medvedev need to kick some major asses in Chechnya – level it all.